It has been weeks since Priyanka Chopra and Nick Jonas’ roka/engagement ceremony but the excitement around it is not fizzling out, at all! 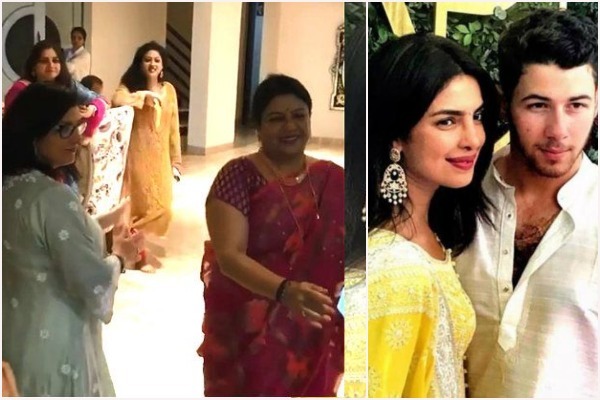 Why would it because just recently Nick Jonas’ mother Denise Jonas a.k.a Mama Jonas shared a short video featuring her and Priyanka Chopra’s mother Madhu Chopra shaking a leg to the beats of a Punjabi song! Mama Jonas shared the short video on Instagram of her trying to match Madhu Chopra’s dance moves while grooving to Punjabi singer Sharry Maan’s 2016 song ‘3 Peg’. In the beginning we can see Madhu Chopra trying to guide Denise Jonas and then finally Mama Jonas getting the hang of it. Mama Jonas posted this video with the caption: “Thank you @madhumalati for being patient with my lack of dance skills! I miss you. #engagementparty” (sic). Denise even shared the same video as her Instagram story and wrote ‘Family’ as the caption. Madhu Chopra and Denise Jonas resemble every Punjabi mother dancing at a wedding with her children’s mother-in-law, right? Certainly, Nick Jonas’ parents’ foray into Indian culture must have been memorable as they cannot seem to stop sharing pictures of the roka/engagement party! Clearly, if Nick Jonas and Priyanka Chopra get married as per a traditional Punjabi or a Hindu ceremony, no one will be happier than Denise Jonas and Kevin Jonas! However, as per several reports Madhu Chopra has clarified that Priyanka Chopra and Nick Jonas are busy with their work commitments and do not have an early marriage on their minds. Madhu even revealed that the recently engaged couple have not decided a wedding date or the venue. Previous : Happy Phirr Bhag Jayegi Actor Jason Tham Gets Engaged To Girlfriend Deeksha Kanwal Sonalkar!